Sarah Abed, an independent journalist, and political commentator, spoke with Sputnik about Ukraine’s detention of head of RIA Novosti Ukraine Kirill Vyshinsky, who has been confined for 100 days now. Russian President Vladimir Putin said that Vyshinsky’s arrest demonstrated an unacceptable policy of Ukrainian authorities targeting journalists. Sputnik: Vyshinsky has been confined for 100 days now, what progress has been made on his release? Sarah Abed: Unfortunately, not enough progress has been made, as he is still detained. However, he has requested that the Russian government (including President Putin) take whatever measures necessary to protect him and facilitate his release. 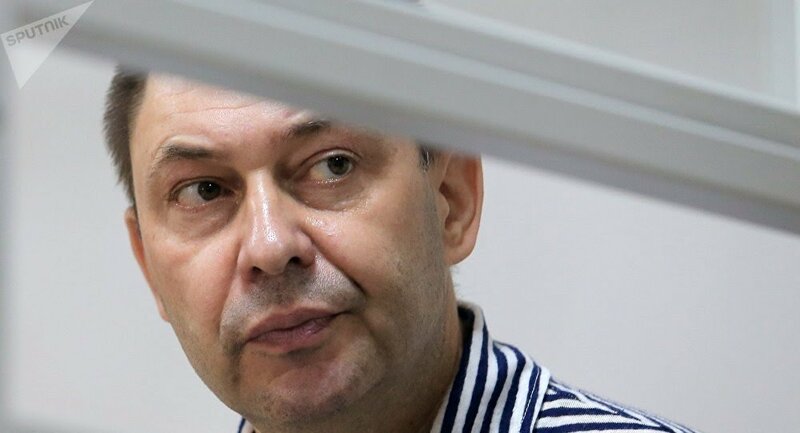 As a result of his detainment, Vyshinsky decided to renounce his Ukranian citizenship. He was detained for acts of alleged “treason” and his home along with the homes of other RIA Novosti employees were searched by security forces on May 15. The Russian government has expressed outrage and stated that this is part of an anti-Russia propaganda campaign launched by Western states. Russia has sent two protest notes to the Ukrainian Foreign Ministry demanding that they cease violence against media workers. Some have also said that what is taking place in Ukraine could be related to the recently opened Crimean bridge. Evidence has yet to be presented that justifies his detainment for the past three months. Ultimately, he could face 15 years in prison if found guilty. His wife stated she is very concerned about his health issues and that he needs his medication while in custody. The bottom line is he needs to be released or evidence needs to be brought forth to justify his detainment (if it even exists, which is highly improbable at this time). Sputnik: What statement is the government in Kiev trying to make by holding the head of RIA Novosti Ukraine? Sarah Abed: Detaining journalists for having different views than what the Ukranian government and their Western puppet masters consider to be acceptable whilst claiming they are committing treason is sending a clear message that those who do not adhere to the official narrative will be silenced, imprisoned, their homes ransacked, and their lives ruined. Freedom of speech and press is necessary for any democracy to flourish, Ukraine claims to be a democracy, yet is actively suppressing information and limiting journalists’ ability to do their job. This is clearly a political act that not only violates international law, but human rights as well. It is entirely unacceptable to imprison and silence journalists for performing their journalistic duties to inform the public. Sputnik: In your view, how has this situation been covered by Western media? Sarah Abed: Quite frankly it hasn’t been covered by Western media, there has been a conscious deafening silence instead. It could even be considered a deliberate act of censorship by major western media outlets and is most likely due to the fact that Mr. Vyshinksy works for a Russian news agency. The “Russian propaganda” scare is being used to censor journalists and undermine their ability to disseminate and report on information that doesn’t parrot the official western imposed narrative. Journalists worldwide have spoken in condemnation of the Ukranian government’s detainment of Vyshinksy, as well as the Russian Foreign Ministry, Human Rights Watch, International Federation of Journalists (IFJ), and a Twitter hashtag was created #TruthNotTreason. Sputnik: What are your thoughts on his arrest? Some journalists have said that his confinement is a violation of all democratic norms. Would you agree with that? Sarah Abed: Absolutely, as we have seen in this case, Western mainstream media has fallen short in reporting and supporting Vyshinksy’s rights not only as a journalist, but his basic human rights and fundamental freedom of the press which is guaranteed by Article 34 of the Ukranian Constitution and Article 10 of the European Convention for the Protection of Human Rights and Fundamental Freedoms. It is our duty as journalists and commentators to stand by our peers and firmly object to their imprisonment without proper evidence that justifies the allegations made against them. Human Rights Watch has also called for evidence to be presented or that Mr. Vyshinsky is released. As we have seen in the past Kiev has repeatedly imposed restrictions on Russian journalists, including preventing them from entry. These concerns have been addressed by the Russian Foreign Ministry but as of yet, have not been justly resolved.